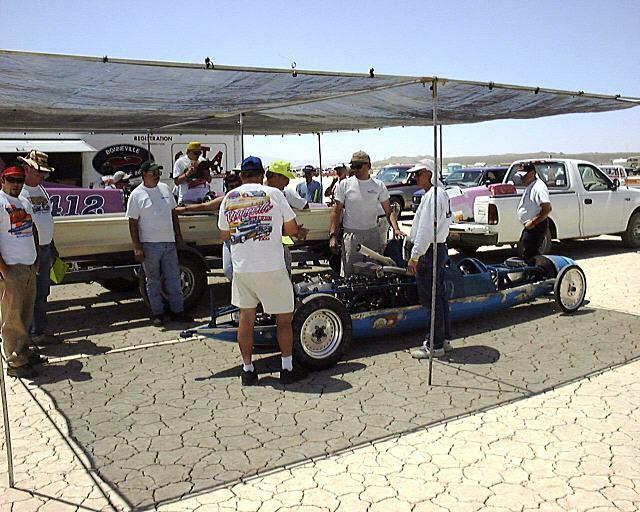 05-07-01 The June 2001 El Mirage meet. Well we had the first race of the season yesterday. I’ll keep you in suspense as to how we did while I describe the weekend. Mark and his son came up from San Diego while James & I came from Orange County. We met at El Mirage Lake about 11:00 am Saturday. This gave us an hour to setup camp and get the car ready for inspection which opens at noon. Since this is a new car, it requires two inspectors and they go over it with a fine tooth comb. Our thousands of hours work paid off with the inspectors having only 2 minor comments, neither of which needed to be fixed before we raced. At 5:00 Pm we did the "Course Walk" which involves most of the racers and crews starting at the starting line and walking the entire course and picking up any objects like bits of glass, wire, little sticks and rocks, and sometimes nails or screws. This also gives you a chance to inspect the whole course. Saturday night, our racing buddy Virgil Wilkins and his son and daughter showed up in their camper to cheer us on. Sunday we had a slow morning. The racing staging lines are run in order of point standings. Since we didn’t run last year, we were almost last to run during the first round. This gave us time to do a few last minuet adjustments to the car and socialize with a few other friends that came out to the race: Tim, Andy, Vance & Marjorie. Our first run was about noon, since we were 191st place in the points standings (everyone who raced last year was before us) fortunately, there only 90 entrants! Mark drove the race car while I drove the push car. I pushed Mark up to about 30MPH, the engine was running great but pulled away slowly. At the finish line, Mark got it up to 115MPH. It seamed that the engine was making a lot of power but we couldn’t get it to the ground. 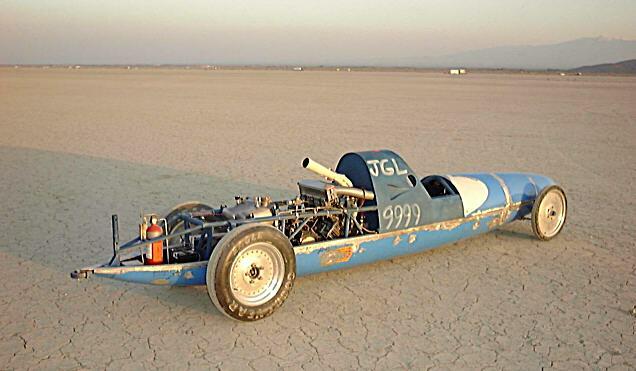 At 2:00pm we made a second run and confirmed that the shifter was working and that the motor was running great, but that the clutch was slipping, so we got a 117MPH. Over all this is about what we figured we would do (110-130MPH). As it turned out, ours was the last run of the day. Near by a motorcycle crashed about the same time as our second run, so the ambulance had to go tend to the rider. There were only 5 people left in line behind us and the riders injuries were bad enough that the ambulance needed to stay with him, so that ended the meet. Remember last week I said this place can be dangerous? I may not do a newsletter next week since there may not be much progress by then.